Well these certainly went down a treat in my house! Who doesn’t like Bounty?? 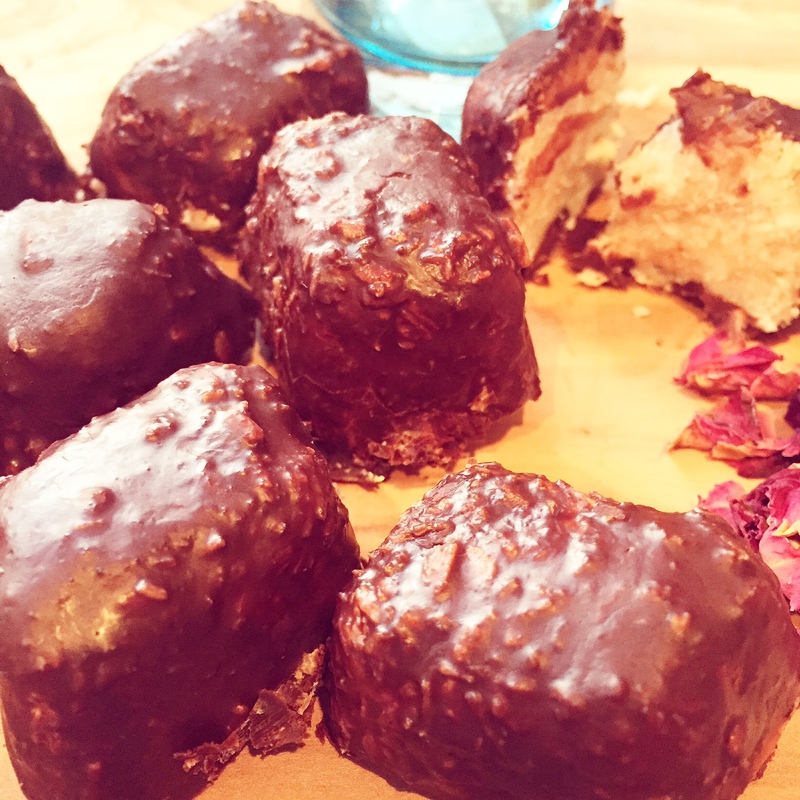 It is one of my favourite chocolates and just like with most things, here at Two Kitchens, we like to create healthy variations for our favourite snacks. These are completely free of gluten, refined-sugar, dairy and chemicals, and require surprisingly few ingredients! Mix the coconut filling ingredients well in a bowl. Get an empty ice cube tray and portion the mixture into the little cube holes and push them in so they gain the right shape. Once you’ve finished the mixture, put this in the freezer for twenty minutes. Meantime, melt the cacao butter and coconut oil in a small saucepan over a medium heat. Once melted, add the cacao. Once combined, while stirring, remove from the heat and add the maple. It will bubble a bit so leave it off the heat while you mix it then when it calms down, put it back on the hob on a low heat for a minute, until fully combined. Once the coconut bites are ready, remove from the freezer and from the ice tray and put them on a plate. Coat each one individually in the chocolate, then, leaving them to sit on a plate put back in the freezer for 10 minutes, remove, and repeat this step as the first chocolate layer will be absorbed by the coconut oil but the second layer will go on nicely. Leave for about half an hour, remove, and store in an airtight container in either the fridge or freezer for up to two weeks.